Laurel Hedges are a unique group of plants, and they are particularly well-suited to hedging. They are technically in the Prunus genus and they are not “true” laurels at all! This may be why they are often called “Cherry laurels” –cherries and plums are also Prunus species. Laurels are broad-leafed evergreens, meaning they have wide, leathery leaves that stay on the plant all year long. 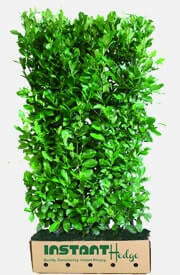 This makes them ideal for privacy hedges, along with the fact that they are very fast growers. They are also highly drought-and heat-tolerant. Despite not being true laurels (true laurels would be in the Laurus genus, i.e. Laurus nobilis, Bay Laurel), their leathery evergreen leaves do bear some resemblance to their namesake. 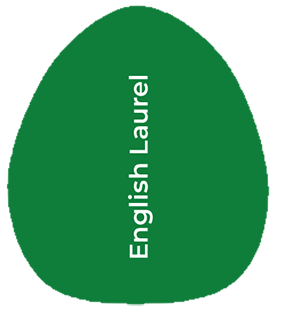 For our purposes, when we say “laurel”, we mean “cherry laurel”. There are several types of laurels that have great commercial value and are very popular for landscaping. Some of the most popular are the English laurel (Prunus laurocerasus), Schip laurel(Prunus laurocerasus ‘Schipkaensis’, also known as the Skip or Schipka laurel), and the Portuguese laurel (Prunus lusitanica). The main differences between them are their hardiness zones, growth rates, growth habits, and foliage appearance. 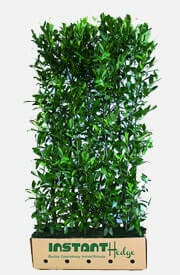 Laurel hedge plants grow in a lot of regions, and they are a great option for warmer areas. 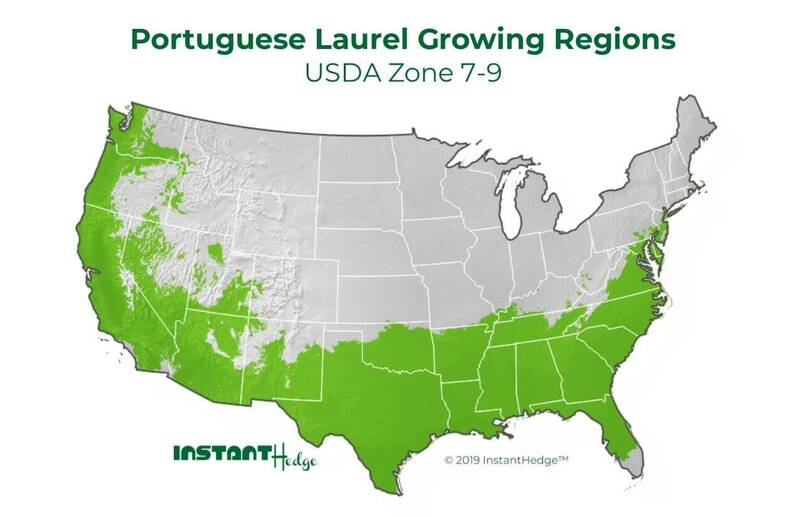 We at InstantHedge are always on the lookout for the best hedge varieties to grow, and we recently began production on a laurel that is hardy to Zone 5! (Prunus laurocerasus) aka English laurel thrives in moderate to warm climates. It is smog tolerant and grows well in a wide range of soil types. It is drought tolerant once established. (Prunus laurocerasus ‘Schipkaensis’) is tough. It does extremely well in the winter, so much so that you can sometimes get away with it in warmer parts of Zone 5. It tolerates a wide range of soils and is drought tolerant once established. (Prunus lusitanica) also called Portuguese laurel is great choice for warmer climates. It is smog, salt, and drought tolerant, and grows well in all kinds of soil. Excellent for coastal areas. 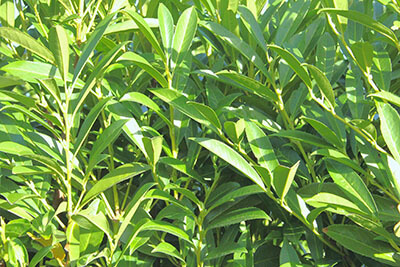 Laurels generally grow very quickly, making them ideal for fast-growing screens. 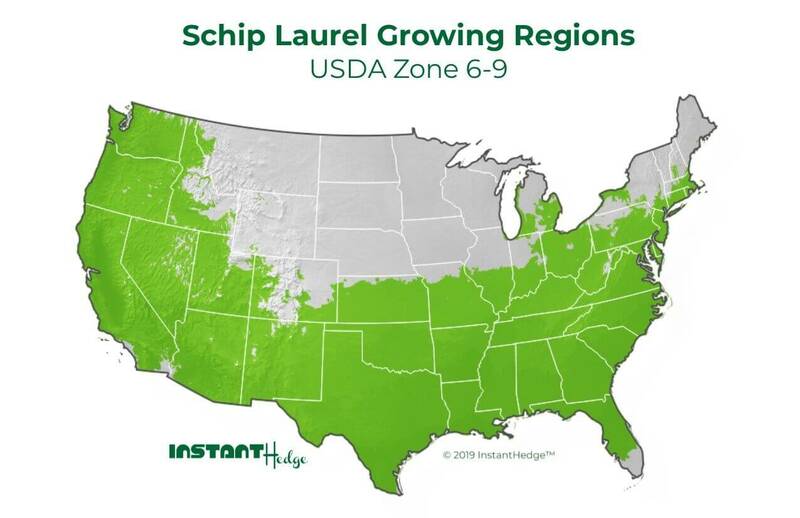 English laurels and Schip laurels grow very fast, increasing by 1-2 feet per year in the right growing conditions. 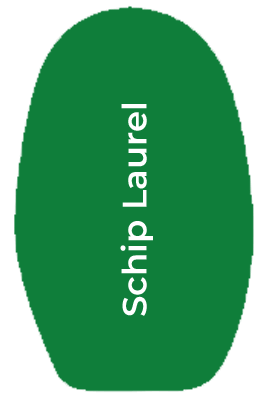 The main difference is that English laurel will grow up and out rapidly, while the Schip laurel grows mainly straight up and stays quite narrow. Looking at the natural growth habit of the different types of laurels is helpful when deciding which is the best choice for a certain location. 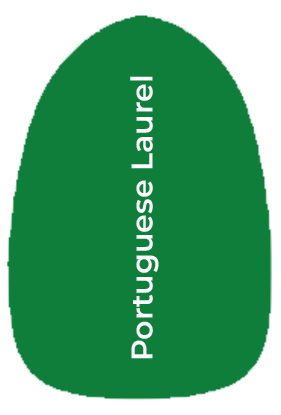 You can see from the diagram below that the Schip laurel and Portuguese laurel will require a lot less pruning to maintain a narrow profile than the English laurel, but the English laurel will reach the tallest height the fastest. Different varieties will be better suited to different spaces. 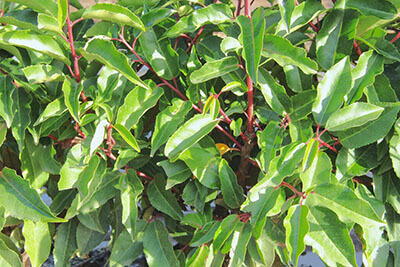 There is a big difference in foliage appearance between the laurel varieties. They all boast white flowers in spring and shiny black (inedible) berries in the summer. English Laurel has wide, glossy, bright-green leaves. 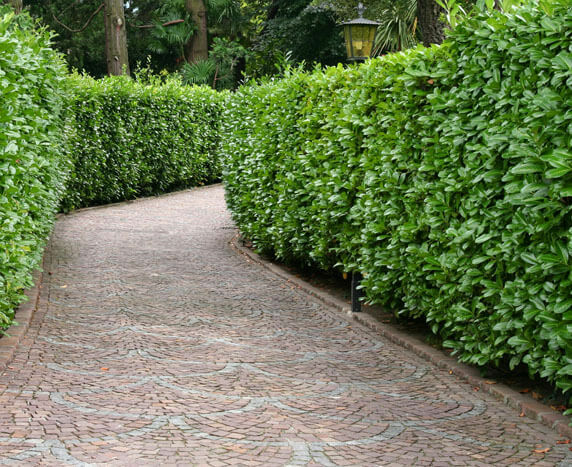 All of these laurels make excellent hedges, particularly privacy hedges. They will require some maintenance to keep as a nicely manicured hedge, but different kinds will be more or less labour-intensive. 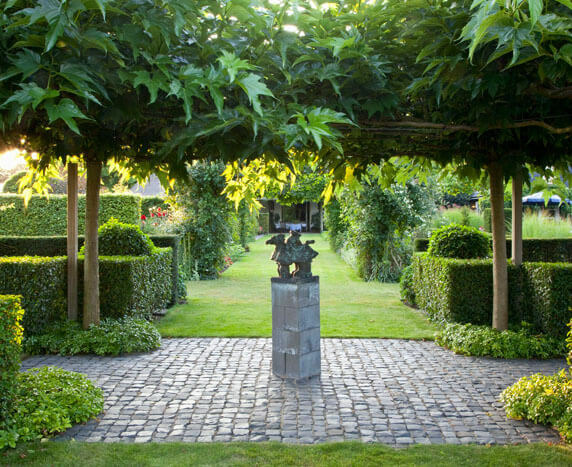 It is important to keep up with your pruning, as waiting too long will result in thick branches that will be unsightly until foliage grows around them. 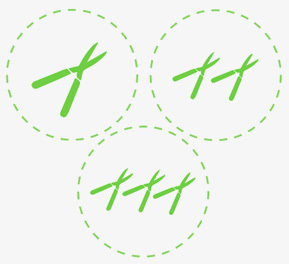 grows very compact, but pruning once per year will help maintain it’s compact shape. It is well-suited for a mid-sized hedge. Schip Laurel will need yearly pruning to keep under control, and you could do some extra shaping to keep width in check. Easy to maintain as a tall and narrow privacy hedge. will need yearly pruning to keep under control, and you could do some extra shaping to keep width in check. Easy to maintain as a tall and narrow privacy hedge. Prune the top half of the hedge to e slightly more narrow than the bottom half. This will prevent the lower foliage from shading out and will keep your hedge uniformly beautiful for years to come! The problem with a lot of varieties used for hedging is that they do poorly in shade. Laurels to the rescue! 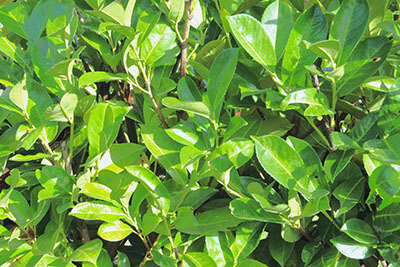 English and Portuguese laurels both do well in part shade, and Schip laurels can take almost full shade. Perfect for hiding fences in dry, shady areas. can both grow in full sun to partial shade. can grow in full sun, partial/dappled shade, and almost fully shaded environments. It is possible to be too versatile? Yet another point of excellence: deer don’t touch laurels. 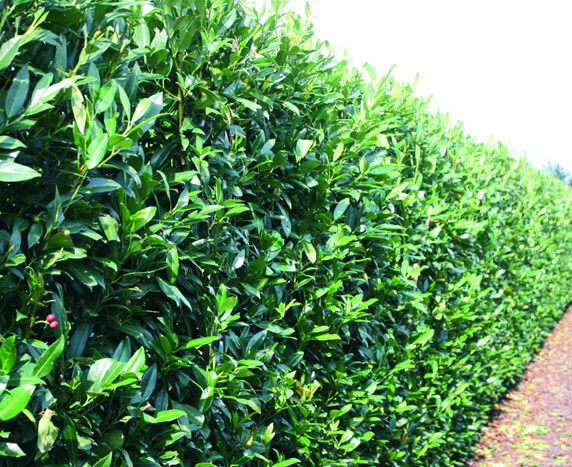 Laurels fill a unique void for fast-growing, broadleaf evergreen hedge plants. 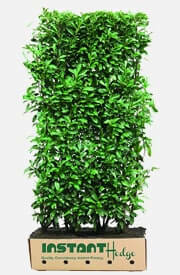 They make excellent privacy screens that can be grown really to any height desired. They add beautiful texture and respond very well to heavy pruning. Fast-growing, evergreen privacy hedges are always in demand. Laurel hedges will block ugly views and fences, give privacy without blocking light, muffle noise, filter air, and provide a habitat for small birds and beneficial insects. Portuguese laurels do very well when maintained as a waist-high hedge to give definition to different garden spaces. They can be pruned intensively with no ill effects.